All dogs are evolved as carnivores, possessing a biological need for a diet rich and varied in fresh whole meats supplemented with smaller amounts of fruits, vegetables and grasses. That is why Biologically Appropriate ORIJEN Adult features unmatched inclusions of cage-free chicken and turkey; nest laid eggs and wild-caught fish - the origen of which are all farmed or fished within the local region and delivered FRESH EACH DAY so they are brimming with goodness to nourish completely. Prepared from Canada’s best and freshest ingredients in award-winning kitchens, ORIJEN keeps your adult dog happy healthy and strong. Read our ingredients and we think you'll agree! 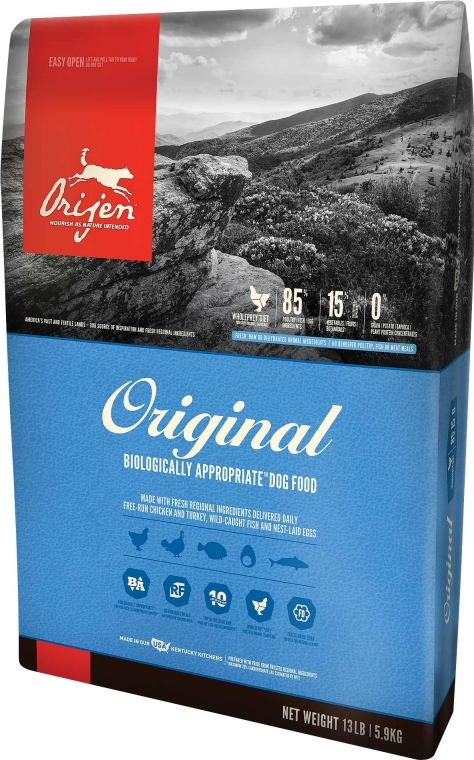 Orijen Adult Dog food features unmatched inclusions of cage-free Cobb chicken and turkey, whole nest-laid eggs and wild-caught fish - all farmed or fished within our region and delivered to our kitchens fresh each day so they're never frozen, preservative-free and bursting with goodness to nourish your dog completely. 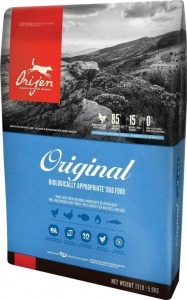 Orijen Adult Dog Food Ingredients: Fresh chicken meat (13%); fresh turkey meat (7%); fresh whole eggs (7%); fresh chicken liver (6%); fresh whole herring (6%); fresh whole flounder (5%); fresh turkey liver (5%); fresh chicken necks (4%); fresh chicken heart (4%); fresh turkey heart (4%); chicken (dehydrated; 4%); turkey (dehydrated; 4%); whole mackerel (dehydrated; 4%); whole sardine (dehydrated; 4%); whole herring (dehydrated; 4%); whole red lentils; whole green lentils; whole green peas; lentil fiber; whole chickpeas; whole yellow peas; whole pinto beans; whole navy beans; herring oil (1%); chicken fat (1%); chicken cartilage (1%); chicken liver (freeze-dried); turkey liver (freeze-dried); fresh whole pumpkin; fresh whole butternut squash; fresh whole zucchini; fresh whole parsnips; fresh carrots; fresh whole red delicious apples; fresh whole bartlett pears; fresh kale; fresh spinach; fresh beet greens; fresh turnip greens; brown kelp; whole cranberries; whole blueberries; whole saskatoon berries; chicory root; turmeric root; milk thistle; burdock root; lavender; marshmallow root; rosehips; enterococcus faecium.